Greenwise marmoleum is better then vinyl but I liked the concrete look of the Vinyl better. Besides this material is less sturdy and should therefore be easier to install. The Forbo technical department gave instructions on how to do this in an RV. First we need a paper model of the floor. Remove all staples and other imperfections. Reflex paper is placed under the heat mats we purchased. Every dent or hole will be seen threw the Vinyl eventually so a layer of 3mm plywood will even the floor out. This is how far we have come. This is how the floor looks today, yes its almost done. You’ve done a beautiful job with the renovation of your GMC. I am very intrigued by the “heat mat” that you’ve installed beneath the vinyl flooring. Is it far infrared? 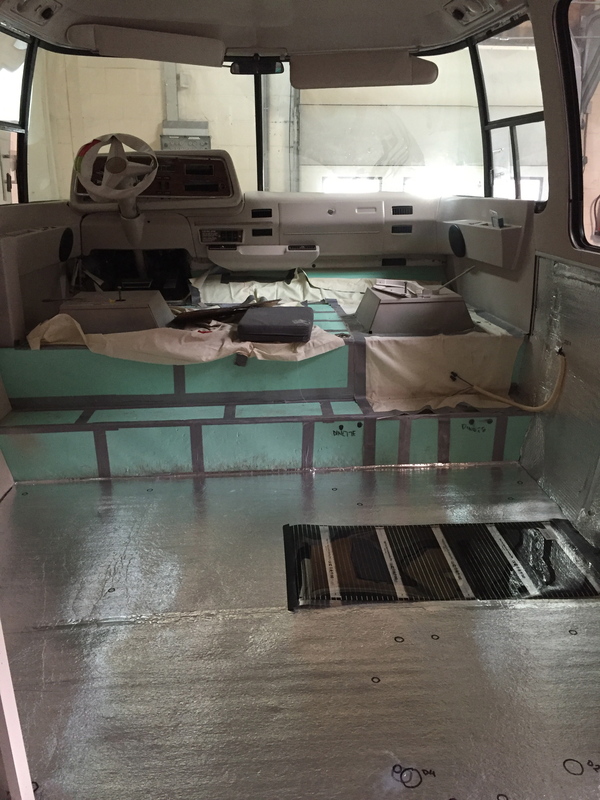 I’ve been researching far infrared radiant film for use beneath flooring and this is the first time I’ve seen it done in a GMC. How effective in heating the interior of the coach is this heat mat, or is it merely to keep the floor itself warm? And, what is the power draw as far as wattage, is it useful as a heat source when camping without utility hookups, does it drain the battery or is it very economical? The heat mat is from “HEATNET”. This 2HEAT foil heating matt is 0.2 mm thick”. It is in 50 or in 75cm wide and the length is flexible. We installed the 220V version of 100 Watt per/m2 and additional RCD (by an electrical installer). As our main heater does not work we only have this and it works really well but we did put the matt down on all free floor spaces. I do regret not to take the 12 volt version for wildcamping / boondocking, so I really can not say if it would effect the battery much. Thanks for replying so quickly. What is the coldest temperature in which you’ve used the heat mats to heat your GMC? Light freezing (below zero degrees). In October it was 8 degrees outside and we had 20 degrees inside with the heat mats. Still having an additional heating is recommendable. OK, so it’s not adequate to heat the interior in below freezing weather. Thanks for the info! Hi, did you remove the old plywood floor, or did you add new stuff to the old cleaned up plywood? Your changes are amazingly beautiful! Hey Olly, you got already an answer from Chris right? Otherwise let me know.